Data from the Ministry of Power shows that despite making progress towards achieving 100 per cent village electrification, Bihar lags considerably in household electrification, with 52 per cent of households still unelectrified. While the state government’s Har Ghar Bijli Yojana is ambitious and encouraging, focusing only on household electrification may not be enough, as merely being connected to the grid does not guarantee access to electricity. 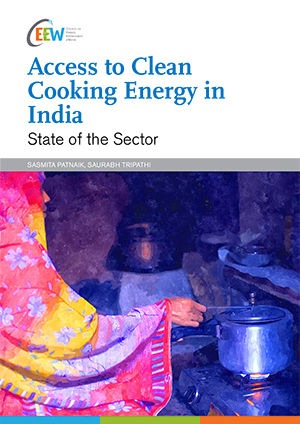 This policy brief presents findings and recommendations, based on the ‘Access to Clean Cooking Energy and Electricity: Survey of States’ (ACCESS) 2015, for improving the household electrification rate and improving the satisfaction derived from electricity for households in Bihar. 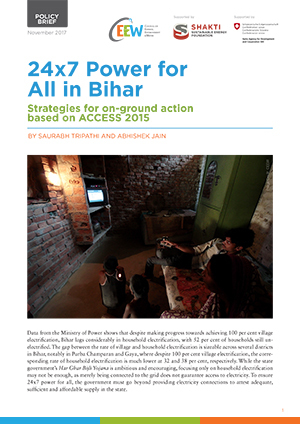 Over 50 per cent of unelectrified rural households in Bihar live in habitations with grid electricity. For them, steep upfront cost and recurring monthly cost were the biggest barriers to get an electricity connection. 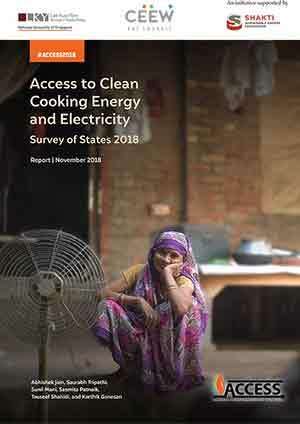 Sixty-two per cent of unelectrified households found the monthly cost of grid electricity to be a barrier to electrification, and yet most such households spent much more on kerosene for lighting than they were willing to pay for grid electricity, highlighting the prevalence of a perception that recurring expenditure of electricity is too high to afford. A few key interventions in Bihar could help electrify more households rapidly and improve reliability and quality of power in the state. Only seven per cent of electrified households were satisfied with grid supply. Unreliable supply and voltage fluctuations were the main reasons for the dissatisfaction of households. Poor supply situation is also reflected in the fact that while 41 per cent of households were connected to the grid, only 21 per cent used it as their primary source of lighting. Supply duration in Purba Champaran and Siwan was much worse than other districts, with around 90 per cent of households receiving supply for eight hours or less in a day. Fifty-four per cent of electrified households reported experiencing four or more days of 24-hour blackouts in a typical month. 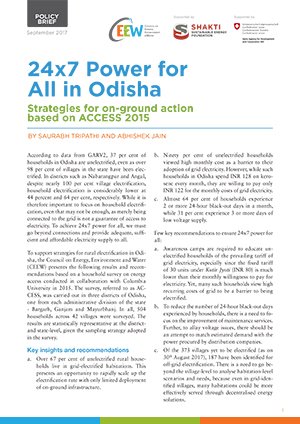 Prioritise the electrification of households in habitations that are already connected to the grid, particularly in Bhagalpur and Samastipur, to rapidly increase the rate of household electrification, as this is likely to require limited deployment of heavy onground infrastructure. Organise awareness camps in unelectrified habitations to educate households of the prevailing tariff of grid electricity, as an attempt to amend the general perception of people about the high recurring cost, even when they spend as much if not more on kerosene for lighting. 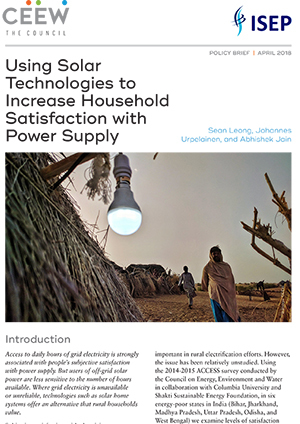 Improve the satisfaction that households derive from electrification, and the management of grid electricity as a service. 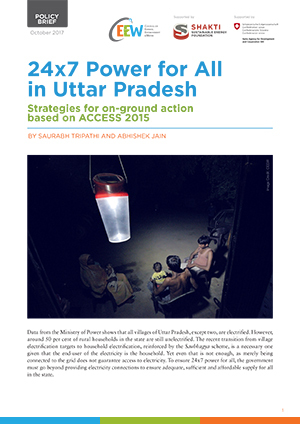 Improve maintenance services to reduce occurrence of 24-hour black-out days, and particularly increase the hours of supply, particularly in districts like Siwan and Purba Champaran, where satisfaction with grid electricity was reported very low. Improve billing and collection efficiency, particularly in Nawada, Patna and Samastipur, where a large proportion of households with meters were either not paying anything for the grid, or paying a fixed amount instead of receiving variable bills.